i have been lurking for a little while, but am now actually going to post! i am thinking about making the step into modular synths. i have used many modular software synths (reaktor/tassman etc) and have a nord modular (micro) so have some small experiance. i was just wondering where people tend to take the final audio out from there modulars? and does the quality of this final stage matter, does taking this final output from module A sound better than module B? obviously in software the signal path tends to end with an amplifier of some kind, do people here tend to always end there patches with a certain module i.e a particular vca or mixer, or what about straight out of a filter. does it really matter where you take the signal out from at all? sorry if this has been asked before, i searched and searched the forum but couldn't find anything! In theory it doesn't matter which module is the last in the modular audio chain. You could go directly from the VCO into your DAW. In practise some modules will have a better (worse) SNR than others. Others will slightly distort the audio signal which can be both good and bad. Even a VCA can have a sound on it's own. So it makes sense to compare different makes. The output of a modular can get very hot that's why I have sometimes an attentuating module before my DAW. It works for me but actually I should change some settings at my DAW but I haven't figured out how to do it yet. Modular levels can definitely get too hot for some mixer/DAW inputs, so it's pretty common to put an attenuator or in my case a modular mixer at the end of the chain before hitting your DAW. The idea being to have control at the modular itself and a place to adjust levels before they hit your DAW. The dynamics can get extreme too so it's good to have a knob close by to grab when things get crazy (and they will). Some people use a compressor or limiter there for that reason as well but my preference is just a mixer. Depending on your rig and proclivities, you may end up with several sounds happening within the modular at once and a mixer at the end of the chain gives you a chance to balance the various elements right at the modular and set overall level at the same time. Like the good doctor says, a mixer is a common end point, and what I use. I have a motm 830 mixer that more or less is always hooked up to my main monitor mixer. I own the Doepfer A-100 System. I am questioning if I should use the A-138 Mixer, or the A-131 VCA as the output to my audio interface into my DAW? I've read the previous responses and I guess I understand to some degree, it may depend on what characteristic sound I want, as each module may give me something different. I'm asking more so from level wise, does it matter if I went from VCA--> Mixer --> DAW , or from Mixer --> VCA --> DAW? Taking the signal from the VCA will probably give you the "hottest" output. It will arguably also be a cleaner signal. Taking the signal from the mixer does allow you to attenuate the signal before it leaves the system. The difference really lies in where you are going to patch the modular into (DI box/mixer/interface). If any of these have a pad function on them, you wouldn't need to attenuate the signal before it hits the input. Everything will have a slightly different sound so it's really all personal preference. Play with setups and see what works and sounds best to you. Being a total modular beginner, I (over)thought about this too. But now that I have my first modular since yesterday, I just plugged the output of my VCA (Intellijel uVCA) or the outputs of my MI Clouds directly into line level inputs of my audio interface (Behringer ADA8000's with the input gain turned down a bit) without any problems of levels being too hot or bad s/n. I can even drive the uVCA into saturation without getting too hot of an output level. The same applies for the other way around, where I can easily feed audio from my DAW into the Clouds. I even don't have to crank the input gain on the Clouds. So far I don't see the need for a dedicated output module. Howdy! As everyone has stated...lots of options. I often have a reverb or a delay module last in chain before my DAW interface (TASCAM US-20x20) for single voice parts, but just as often I'll run multiple outs from multiple voices when I'm creating larger multi voiced, multi sequencer patches. The beauty of the US-20x20 is the set of 8 XLR / quart inch combo jacks on the front. This allows me to record each voice on a separate track for later editing hijinks and tomfoolery. I built my own 2U output module also. It is a 3 channel mixer with LED indicator for clipping to +/-5V. There is a 4th channel which mixes in an A440 sine reference tone for tuning. It also has spring reverb. That is followed by an AC coupled attenuator that used to go to my Carver PM-600 power amp. 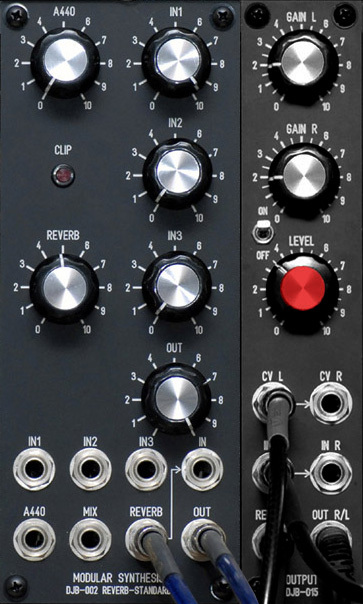 Details are on my DJB-002 Mixer / Spring Reverb / A-440 Standard module page. Note that I used the MOTM-000 prototype card for construction. I do like the spring reverb and the A440 tuner at the end of my signal chain. Later, I added a 1U output module which includes a VCA so I can use a foot pedal for overall volume (ex organ player). I added a switch for remote turn on of the power amp and two controls for minimum gain which basically sets the level for the up position of the pedal. I also added an overall gain control and it is the only red knob I have in the system. That's because I'm driving 600 watts with this module and want to be able to find it fast. Details are on my DJB-014 Output Interface Module page. Between the two I now leave my YUSynth Fixed Filter Bank patched to split the mono signal into a left and right. Nice. In MU, Moon has a CP-format stereo output mixer in the catalog (543 CP) that has voltage control, a tuner, and headphone output. Anticipating delivery this year. I did a separate module for my headphones. I put those in a utility module with the main power switch and then also a cable tester for opens and shorts. That is one of the reasons I added a power switch for my Carver power amp so I could turn off the amp and just use headphones. Details on my DJB-006 Control Module page. These are some of my earliest modules I made in 2003 - 2007 when there wasn't a lot of choices besides MOTM, Oakley Sound, and Blacet for this format or DIY. Hi also new here and I found this thread with the search. Is there any problem with plugging a modular Output in a Active DI Box? I have a X32 Mixer, and therefore need to convert the signal to Symmetrical bwfore i can plug it in. Depends on the DI and synthesizer. Some modulars have a hot (ca +- 15v) output and can overload certain DI boxes. If the DI has a pad it, use it and you will probably be OK. It needn't be an active box-- I have done well with ART boxes such as the DUALZDirect. ART makes some really great and useful stuff without killing your collection of munny. I use four ART mic preamps (they're around $35.00 each) for my four pickup Jazz bass. Each pickup has it's own output jack, I send the output of each pickup into it's own dedicated ART mic preamp. From the mic preamp outputs I do despicable things to the individual signals, mix them back together and send the L/R sum to a dual channel power amp and out to two separate speaker cabs (not L/R stereo, just two very different cabinets, one on top of the other, each with it's own processed bass signal). Those little ART preamps are the dog's balls. I also use a DI with a 40db pad to cool off the output of my 1962 Hammond C3 before it hits a couple of piles of pro audio gear. So the DI thing may work, depending on this-n-that (as was mentioned above by Member *pelsea). People generally overthink this. You don't need to build anything. I'd guess that a LARGE majority of modern interfaces and mixers can handle modular levels just fine, and I've certainly never run across one that can't. So turn the gain down as needed, and plug in whatever you want into whatever you want, and chances are, you'll be fine.